The iPad is the most popular mobile tablet device worldwide, so it is not surprising that the most reputable sportsbook brands developed web based iPad sportsbooks and sports betting apps. As an Apple fan myself, I use my iPad for a lot of my daily life management and entertainment, including my sports betting action. The size of the display is awesome for streaming events and engaging in live betting, and I actually use my iPad to bet on sports more than I use my computer, even if I'm at home. If you own an Apple iPad tablet, congratulations. You hold in your hands the leading tablet PC in the world. Reading this web page as you are probably means that you enjoy sports betting. As the premier tablet, the iconic iPad is a perfect destination for your sports betting sessions. You love your iPad because it is extremely reliable, your high resolution display is large and clear, and you can access the web from just about anywhere. Apple also continually upgrades its iPad central processor and memory to ensure that you get lightning fast operation. All of those qualities help make the iPad the best selling tablet in the world, and they also perfectly support some of the best USA online sportsbooks. After all, when you want to research and place a bet online, you want speed, you want the display to be clear and simple to use, and you demand quick operation and betting confirmation. That's what you get when you bet with one of our top rated mobile sportsbooks for USA players. 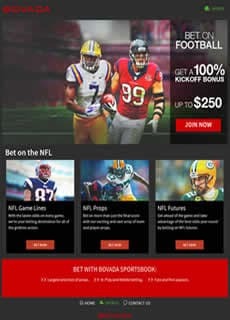 The iPad mobile sportsbook at Bovada is one of the most user frirendly, high quality and robust applications available for mobile access to betting on sports. It does not require a download, but can be bookmarked on your home page for easy, one click access. They offer their full range of options, including all their betting lines, live streaming, and even their live betting. The brands listed below represent the top rated iPad sportsbook applications in the business. Most of them are browser based, and provide a great selection of sports events and competitive betting lines to choose from. We have personally evaluated each of them to ensure we only recommend those iPad sports betting apps that were engineered by legally licensed and regulated brands, offering the highest possible quality level of wagering options. Can I Legally Bet at USA iPad Sportsbooks? Probably first and foremost on your mind is whether you are breaking any laws by betting online. While there are no federal United States laws legalizing Internet sports gambling, there are also none that make it illegal for a US citizen to place an online wager. The bulk of the legislation at the state and federal level in the U.S. is directed towards American owned and operated companies. The United States government will prosecute US-based companies which deliver sports wagering options via the web. This sets up the perfect situation for international firms not located inside the USA to legally and reliably allow you to place bets on your iPad or smartphone. Because there are legal online sports gambling industries located in Canada, the UK and other legitimate economies around the world, the top USA iPad sportsbooks they license give you legal sports betting options as a citizen of the United States. Everyone is different, and you probably prefer certain online gambling benefits that another sports gambler may not care about. The premier Internet sports betting sites understand their customers, just like Apple does. They know if they give you what you want, you will give them loyalty. That is why the top USA iPad sports betting sites deliver welcome bonuses and player rewards which are above average when compared to the rest of the industry. The top online gambling firms also ensure that they carry proper licensing, to make for a legal and trustworthy experience on your end. Extravagant and complex wagering options are offered, as well as traditional side and money line betting. The NFL, NBA, NHL, MLB and all major international sporting leagues are supported. But smaller sports like darts, rugby and cricket are also offered for action. You will receive a wide range of reliable banking options, data encryption technology for a safe and secure experience, and mobile as well as desktop wagering access. You will probably notice that we do not recommend more than a handful of quality online sportsbooks. And as an iPad owner, you can probably understand why. The iPad is far and away the premier tablet in the world. It is simply the best. Accordingly, there are not more than a few online sports betting sites that we have discovered in our years as recognized gambling industry analysts as "the best". We hold accounts there ourselves. When you click through the links we provide, you arrive at the top rated USA online sportsbooks, plain and simple. For years these companies have continued to reappear as the best in the business, always scoring high in our review process for banking, reliability, legitimate licensing, customer satisfaction, specially offerings, ease of use, safety and security. They are also financially backed a very high level. The top USA iPad sportsbooks continue to deliver competitive odds and lines, and are sites where we guarantee your satisfaction. What if I have a dispute? What are my options? You know, it's funny. Most Internet sports gamblers never think about the possibility of something going wrong. But smart sports bettors want to know before they open an account if they are going to get screwed when there is a disagreement with their bookmaker. This is a very valid consideration. We take the title of "most trusted USA online sportsbooks" very seriously. Before we became analysts in the online gambling industry, we were, and continue to be, sports bettors. Our review process first and foremost guarantees legal licensing. That is your first sign of legitimacy and trustworthiness. We have found that a few companies are known for quick and reasonable dispute resolution, and extremely high levels of customer satisfaction when handling betting disagreements. As long as you confirm your wager before you place it, and take a screen capture or better yet print out your betting confirmation, your satisfaction in any online sports betting dispute with the principled iPad sports betting sites we recommend is guaranteed. Just contact customer support, air your side of the story, provide your proof, and you will be pleased with the outcome every time.